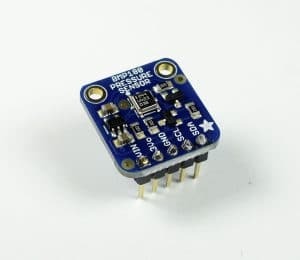 The BMP180 barometric pressure sensor is a great sensor that can be used to predict the weather, detect altitude, and measure vertical velocity. 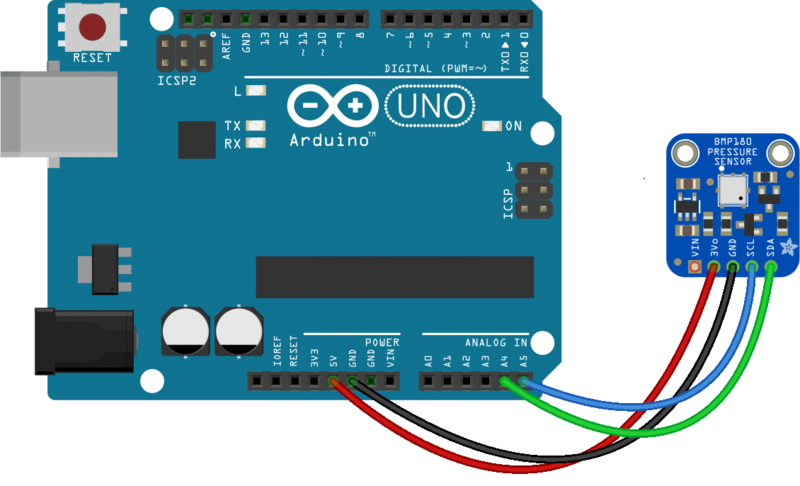 It’s perfect for weather stations, remote controlled vehicles, weather balloons, and lots of other projects. It’s an extremely sensitive sensor too. As you’ll see in a minute, it can detect changes in altitude of just a few inches. In this tutorial, I’m going to show you how to setup the BMP180 on an Arduino, so you can measure barometric pressure, and altitude from the ground or from sea level. But before getting into the details, let’s get some background on barometric pressure and how the BMP180 works. Barometric pressure (also known as atmospheric pressure), is the pressure caused by the weight of air pressing down on the Earth. Imagine a column of air rising from the Earth’s surface to the top of the atmosphere. 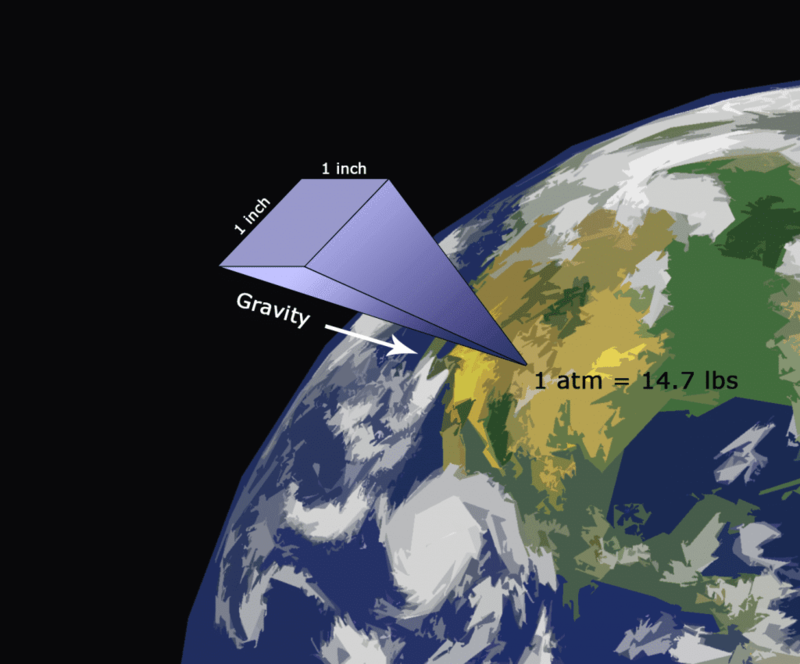 The air in the atmosphere has mass, so gravity causes the weight of that column to exert pressure on the surface. 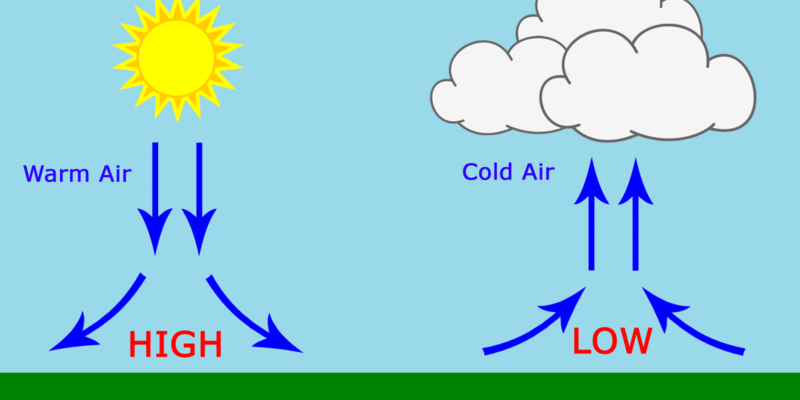 The pressure created by a 1×1 inch column of air reaching to the top of the atmosphere is defined as one atmosphere (atm) of pressure. This column of air weighs 14.7 pounds, which is why one atm equals 14.7 pounds per square inch (psi). 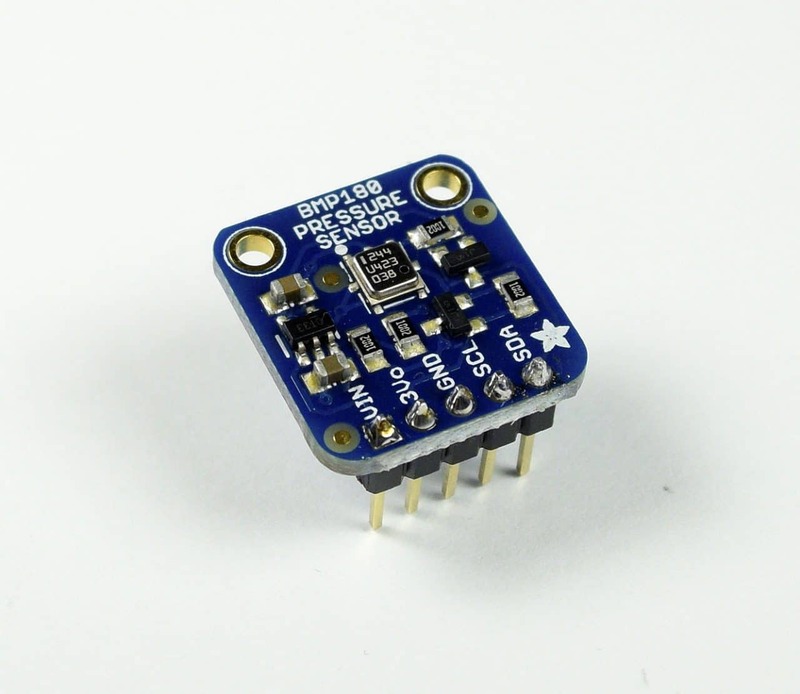 The BMP180 is a piezoresistive sensor that detects pressure. Piezoresistive sensors are made up of a semiconducting material (usually silicon) that changes resistance when a mechanical force like atmospheric pressure is applied. The BMP180 measures both pressure and temperature, because temperature changes the density of gasses like air. 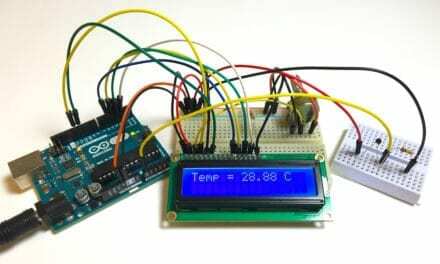 At higher temperatures, air is not as dense and heavy, so it applies less pressure on the sensor. 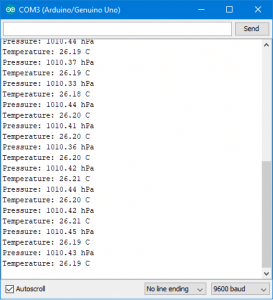 At lower temperatures, air is more dense and weighs more, so it exerts more pressure on the sensor. 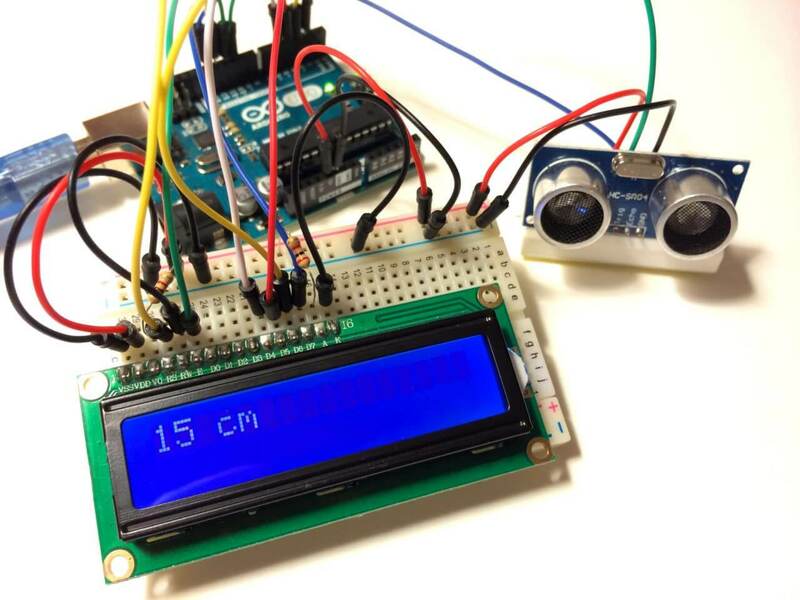 The sensor uses real-time temperature measurements to compensate the pressure readings for changes in air density. This math is performed by the library we’re going to use, so we don’t need to code it into the sketch. 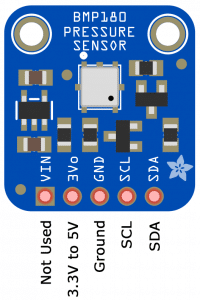 The Bosch BMP180 runs on 3.3V, but many breakout boards have a voltage regulator and an I2C level shifter so you can power it with either 3.3V or 5V. 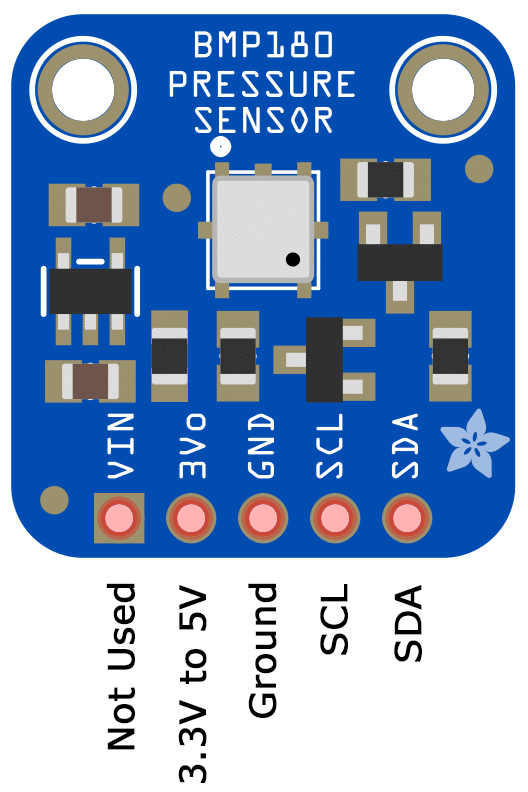 I’ve connected the BMP180 to the 5V pin in this example, but you can power it from the 3.3V pin as well. Before we start programming the BMP180, download and install the library. 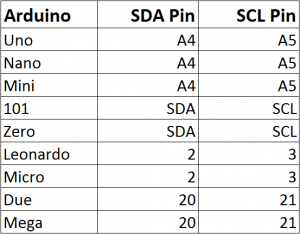 I’m going to use a really useful BMP180 library from Sparkfun. 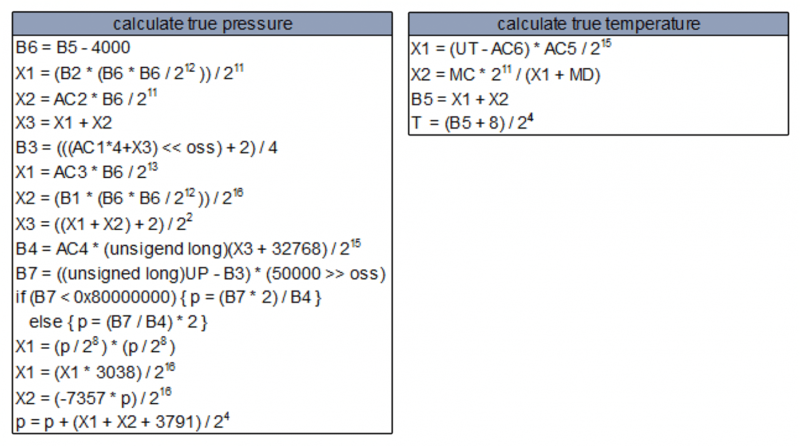 It takes care of all the math for calculating the true temperature and pressure readings, as well as the math for calculating altitude. You can download a ZIP file of the library from this link. 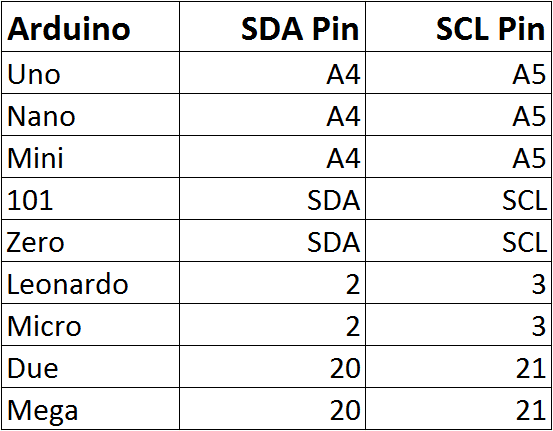 To install it, open up the Arduino IDE, go to Sketch > Include Library > Add Library, then select the ZIP file you just downloaded. Changes in barometric pressure can be used to predict the weather. A falling barometric pressure is caused by a mass of air rising from the Earth’s surface. The vacuum created by the rising air mass forms a low pressure area on the surface. As the air mass gets higher in altitude, it cools down and compresses. This condenses water vapor in the air, forming rain clouds. 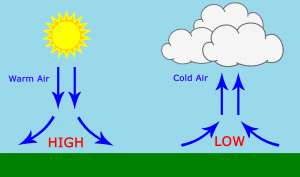 It usually brings wind too, because the surrounding air on the surface flows into the low pressure area. A rising barometric pressure is caused by a mass of air in the upper atmosphere falling to the Earth. The weight of the falling mass presses down on the surface, increasing the air pressure below it. The air mass gets warmer and expands as it gets closer to the surface. The warm expanding air is usually low in humidity, which prevents cloud formations. Rising barometric pressures usually indicate that warm, sunny weather is coming. Try moving the sensor up and down, and you’ll see the pressure value change. The sensor is really sensitive! This is the barometric pressure at your current location and altitude. Barometric pressure will change according to local weather conditions, but it will also change depending on your altitude. In order to compare your readings to weather stations at different altitudes, and readings from news and weather reports, you have to adjust this reading to remove the effect of altitude. All barometric pressure values reported by news and weather stations add a certain amount of pressure to the readings to make it appear that the measurement was taken from sea level. 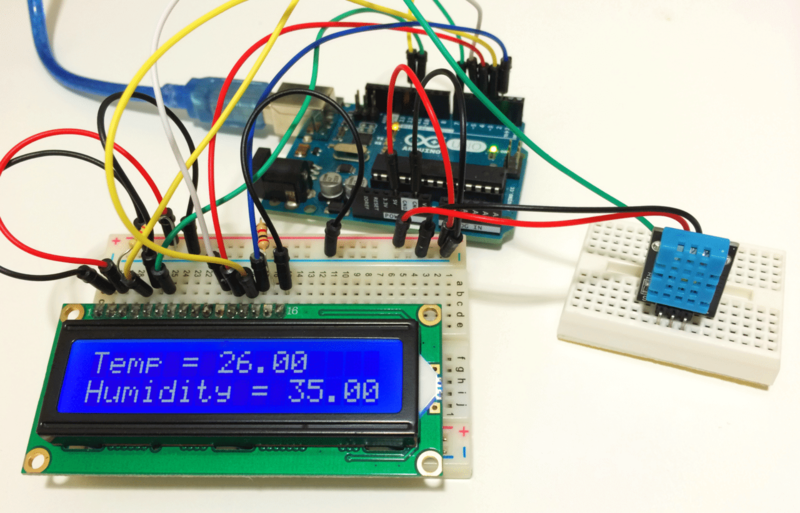 If you’re building a weather station, you’re going to want to adjust your readings too. 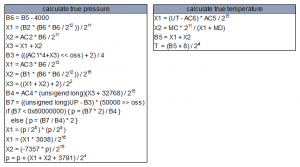 If you notice we also pass it the variable T, since the pressure calculation is dependent on the temperature. Barometric pressure changes depending on the altitude of the sensor. At lower altitudes, there is more air above the sensor, so the pressure is higher. At higher altitudes, there is less air above the sensor, so the pressure is lower. A change of 1 hPa of atmospheric pressure corresponds to a change in altitude of about 8 meters. In this next example, we will use the BMP180’s pressure data to get an accurate measurement of altitude. Luckily the library performs this calculation, so we don’t need to worry about doing this math in the sketch. The atmospheric pressure at your current location will be measured by the BMP180. The atmospheric pressure at sea level is the atmospheric pressure at your current location, adjusted to remove the effects of altitude. It can be found with one of two ways. The most accurate way is to use the BMP180, which I’ll explain how to do below. Another way is to get it from an online map like this one. 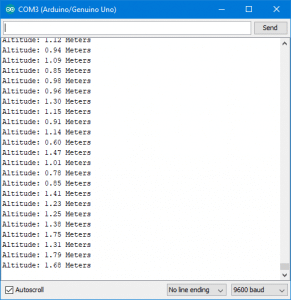 For projects like altimeters, you want to know the altitude of your sensor relative to the ground. To do this, you need to use the atmospheric pressure of your current location instead of the sea level pressure. Use the pressure and temperature sketch to get your local atmospheric pressure. Then insert that value into line 5 of the altitude sketch. The most accurate way to find the sea level pressure at your current location is to use the BMP180 to measure it. The resulting value can then be inserted into the altitude sketch for a more accurate elevation measurement. The atmospheric pressure at your current location will be measured by the BMP180. To get the altitude of your current location, you can use a smartphone app, or search an online elevation map. That’s about it. 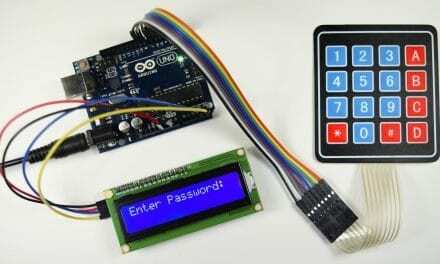 Hopefully this article helps you get the BMP180 hooked up to the Arduino. Let us know in the comments if you have any questions, and also let us know what projects you’re building! 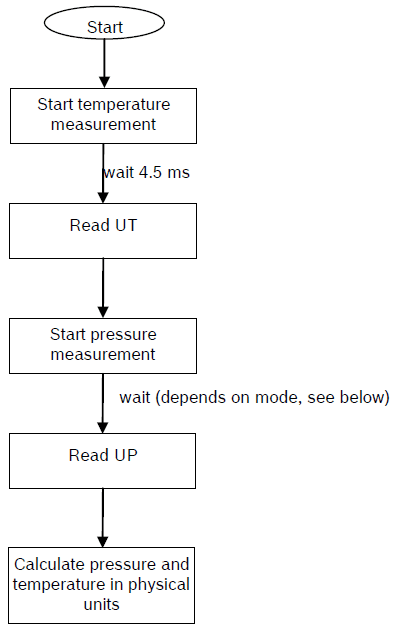 Need to monitor rate of change of barometirc pressure and in addition, to alert when rate of change is rapid, i.e. approaching storm. Could have arrows on display?